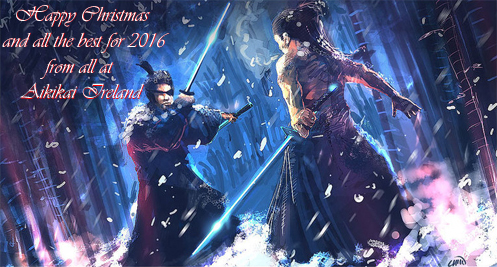 Merry Christmas and a Happy New Year to all Aikikai Ireland members and all of our Aikido friends both in Ireland and abroad. I hope you all enjoy the holiday.Thanks for your continued support and making 2015 such a memorable one. Here's looking forward to 2016!!!!! 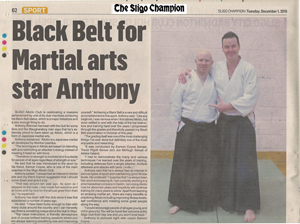 Newly promoted Shodan Anthony Brennan was interviewed by the Sligo Champion newspaper sports editor Emma Gallagher .Emma asked Anthony about the test and his training in Aikido in general. 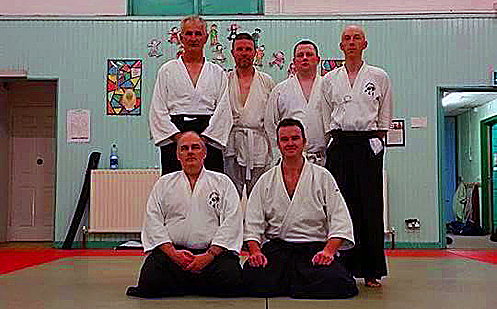 A huge well done to the following Aikidoka that passed their relevant examinations in both Dublin Phoenix Dojo on the 14th and Sligo Aikido Dojo on the 15th..
A huge thanks to Trevor Pigott Sensei for taking the course in Phoenix Dojo and to Eddie Murray Sensei and Barry McGee Sensei for hosting the seminar, and all the guys that turned up and trained too. For the Sligo course a huge thanks also to Declan Bray Sensei and Tony McHugh Sensei for teaching the seminar along with host instuctor Eamon Coyne Sensei and to the students that turned up and supported thge course and their colleagues grading...well done to all!!! 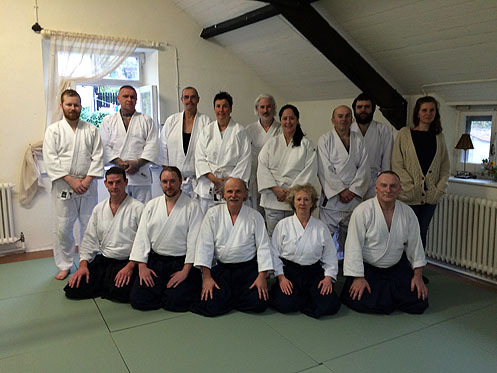 At last nights adults class in Sligo Aikido Dojo we had a drop in visit from Daniel (seated front row fourth from the right) a 2nd Dan all the way from the Traditional Aikido School in Rostock, Germany. Enjoy the rest of your trip in Ireland Daniel from the Sligo crew. Thanks for stopping by. 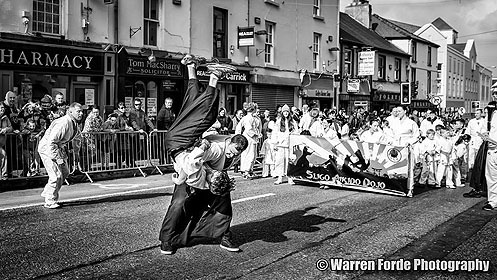 It was with great regret we received the bad news that Michele Quaranta Shihan could not make the course due to feeling unwell the day he was due to fly over, everyone at Aikikai Ireland wishes Michele Sensei a speedy recovery, Michele expressed his wish that the Aikikai Ireland Technical Committee conduct the seminar on his behalf. A big thanks to everyone that attended and made the course a success, well done. Jean Pasley Sensei and Joe McHugh Sensei now up!!! Pictures from the One Day Seminar between Jean Pasley Sensei and Joe McHugh Sensei held on 3rd of October in Bray, Co.Wicklow are now up!!! Aikikai Ireland Technical Adviser Michele Quaranta Shihan and Ikeda Dojo Wicklow instructor Joe McHugh Sensei are just back from s very successful international Aikido Friendship Seminar hosted by dojo instructor Greg O'Connor at Aikido Centers (www.aikidocenters.com) on the September 18th,19th and 20th.At the trip classes were given by Michele Quaranta Sensei, Micheline Vaillant-Tissier Sensei, Linda Holiday Sensei, Francis Takahashi Sensei and host Greg O'Connor Sensei. 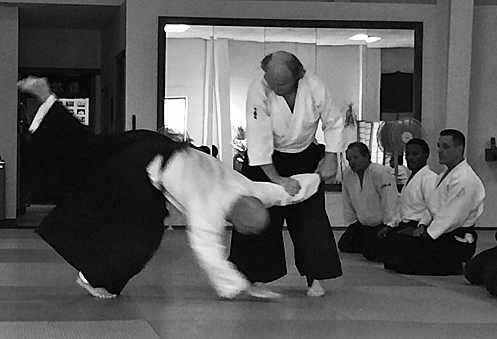 Our very own Joe McHugh was asked would he do the honour of taking one of his classes which Joe graciously and very capably did with all in attendance enjoing Joe's class and Michele and indeed all of the Sensei's teachings. The course was a resounding success and here's to more of the same in the future. Congratulations to Thomas Waldron and Sarah Conlon on their recent engagement in Italy. 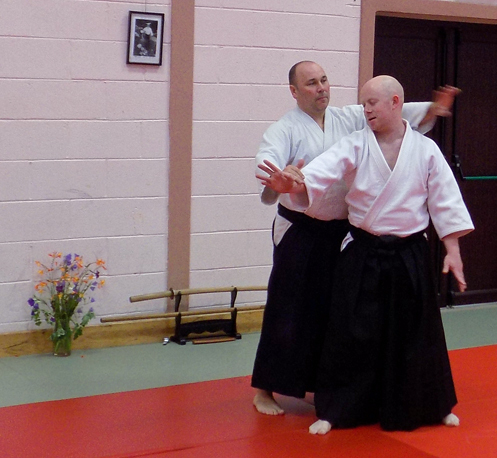 It will be a first wedding for Sligo Aikido Dojo and Aikikai Ireland. 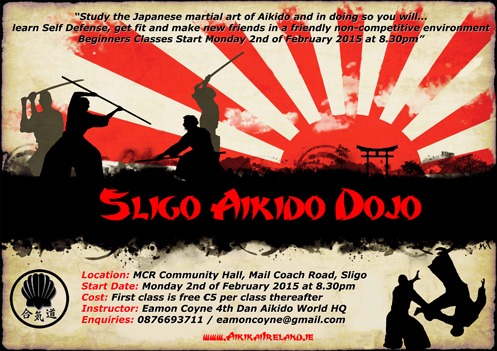 Declan Bray you have a lot to answer for IT Sligo Aikido Dojo is where the love story began. Rumour has it Declan, you are performing the wedding rites. Sligo Aikido Dojo presented the two love birds with a nice bottle of Champagne, hopefully this one will pop Tom lol. We are all delighted for you and wish you the best of luck for the future!!!! Over the past 2 weeks in the Sligo Aikido Dojo the kids class both Senior and Junior also had the end of summer examinations. 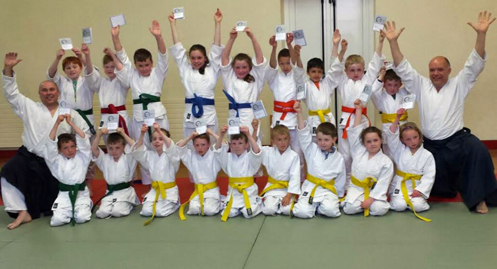 36 of the kids from the Junior and Senior kids classes demonstrated the required spirit and technical proficiency to the level expected by their Sensei Eamon and progressed to the next belt. Well done to all of the successful Sligo adult and kids and also the other students from around the country you done yourselves and dojos proud. 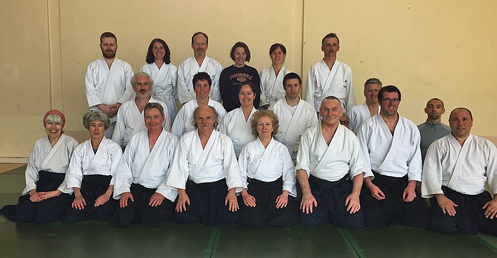 Keep up the great work..
A big thank you to the Aikikai Ireland Technical Committee instructors Joe Mchugh Sensei (Wicklow), Trevor Pigott Sensei(Athboy) and Eamon Coyne Sensei for a great course. Also thanks also to visiting instructors Tony McHugh Sensei (Cavan) and Eddie Murray Sensei (Dublin) and Barry McGee Sensei (Dublin) for attending the course with their students. 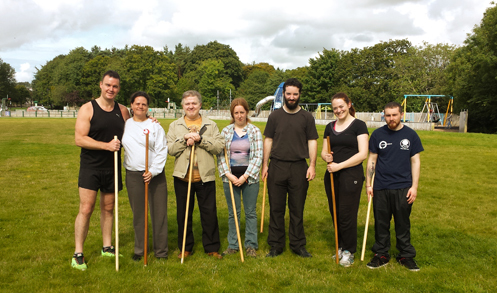 And all the visiting and host Sligo dojo students for putting plenty of good sweat and energy on the tatami today. 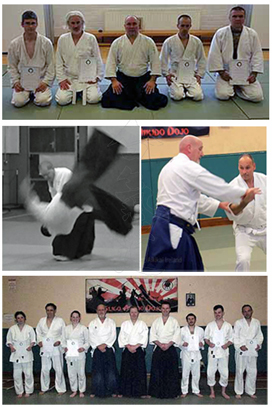 Pictures from the recent seminar with Fiordineve Cozzi Sensei 6th Dan Aikikai now up, thanks to Adrian Shanley of the Athboy Aikido Club for the pics. Click below for pics. 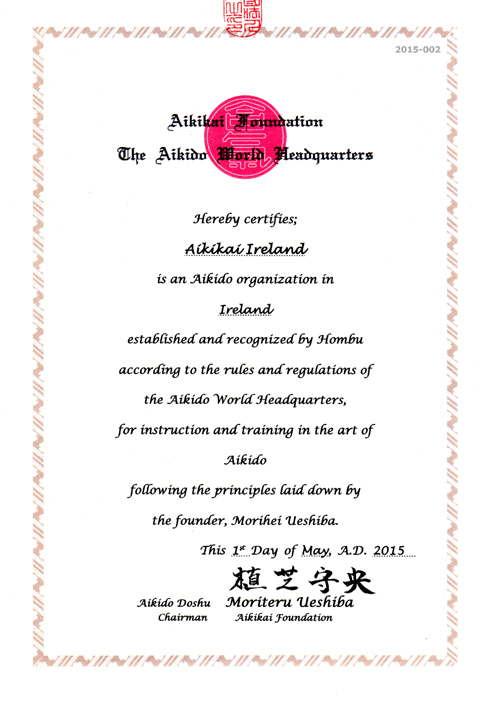 Aikikai Ireland is delighted to announce that it has been issued Hombu Recognition by Aikido Hombu Dojo Japan effective on May 1st, 2015 in accordance with the rules set forth in the International Regulations of Aikido World Headquarters. A massive congratulations to all of the Aikikai Ireland instructors and students who have worked so hard to make this dream become a reality. Here's to our future together. 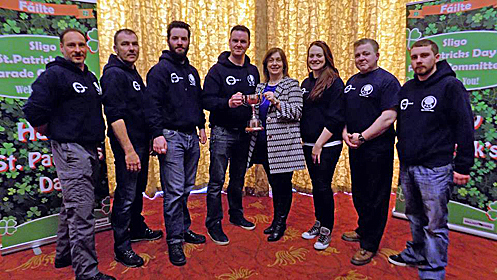 Sligo Aikido Dojo presented with cup for first prize Sport section of the St.Patricks Day Parade which we then brought back to the kids class!!! 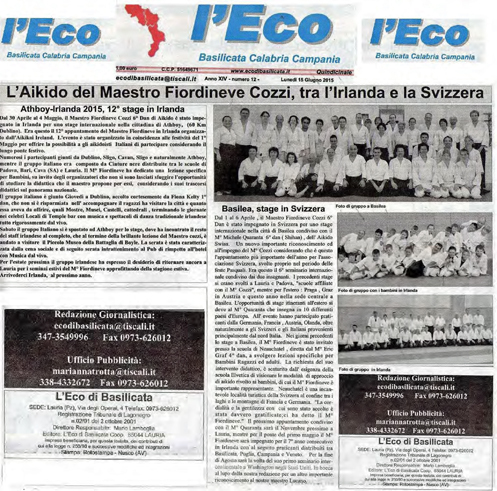 with Michele Quaranta Shihan a great sucess!!! 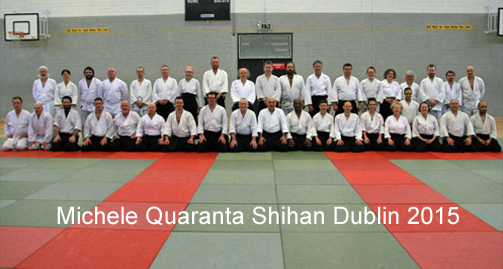 The Aikikai Ireland Shidoshakai Seminar with Michele Quaranta Shihan a great sucess, this was the first time Aikikai Ireland hosted a Shidoshikai course with Technical Adviser Michele Quaranta Shihan 6th Dan. 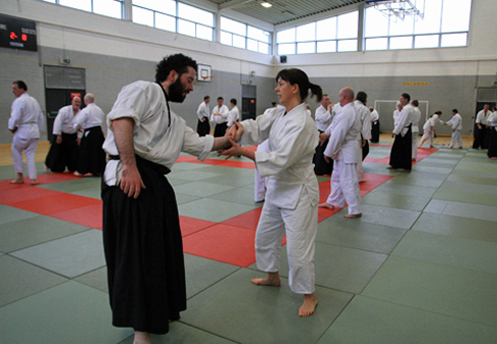 The training was open to students of 2nd Kyu and above, and had particpants from both Aikikai Ireland, Switzerland and other Irish Aikido groups in attendance, which was great to see. At the couse Michele Sensei also presented the last years successful Nidan and Shodan a exam candidates with their diplomas from Hombu Dojo. 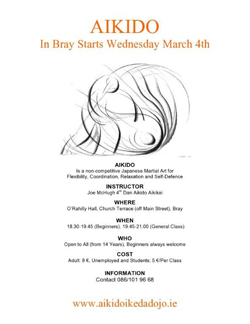 The course was hosted in Athboy by the Athboy Aikido Dojo gang and not forgetting the food that was laid on by Sinead, Ruth, Lena, Pauline and new Athboy member Trevor cheers folks, Click the link below for pics by Declan Bray. 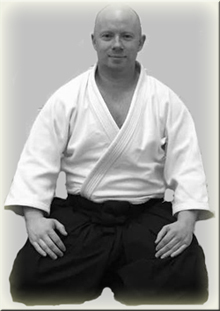 20th of February 2015 marked the 3rd Anniversary of the passing of Yoji Fujimoto 8th Dan Shihan RIP. 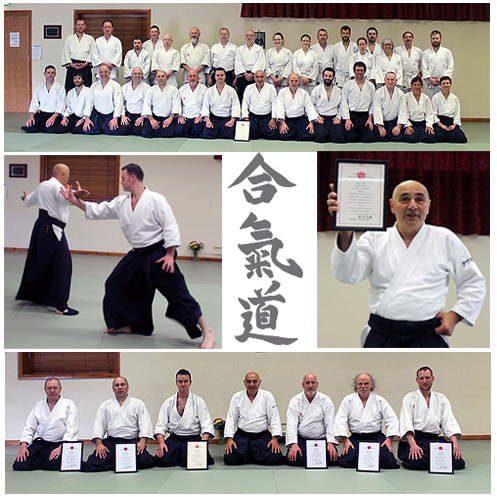 Anyone that has had the pleasure of training with Fujimoto Sensei will have witnessed a very warm, charismatic and elegant Aikido master. 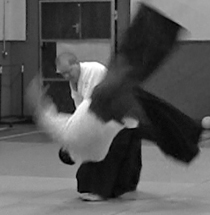 Above is a video of an Embukai given by by Fujimoto Sensei at Basiglio Japan Festival in Milan March 1995. Please enjoy the clip. O'Rahilly Church Terrace (off Main Street), Bray, Co.Wicklow. Adult €8 / Student or Unemployed €5 per class. 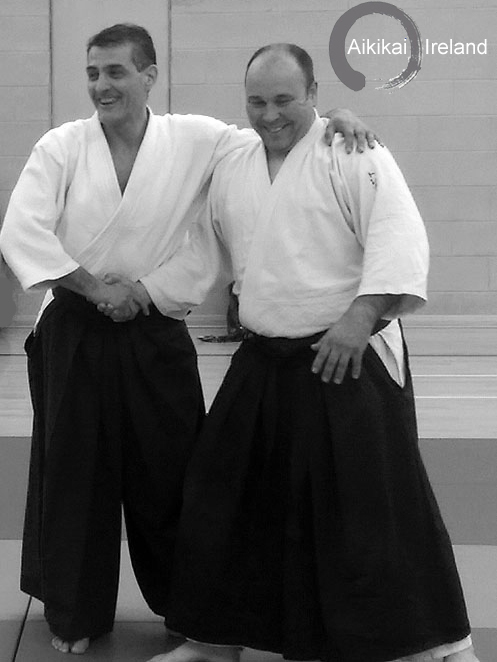 All at Aikikai Ireland would like to wish Joe the very best on this new endeavour. Click the link below for the class flyer. Sligo Aikido Dojo student Daniel (Dinny) Killeen, a biomedical Science Graduate decided to put his extensive experience in bushcraft to great use by Solo Trekking around the coast of Ireland in order to raise money for Cancer Research. This is over 900 miles. All proceeds raised during this SoloTrek will be going towards the Irish Cancer Society and in particular Cancer Research. He is due to start this trek in October and finish late December. The starting point and end point to this mammoth task will be Sligo. 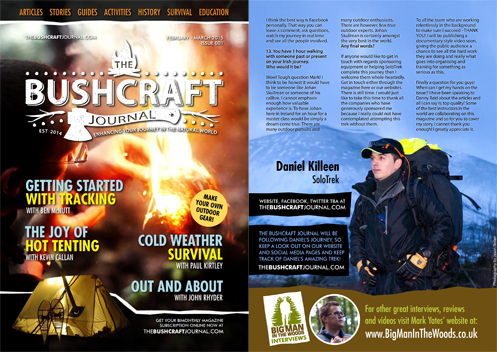 All of Daniels Aikido friends in the Sligo dojo and all the other Aikikai Ireland friends will support him in this endeavour, watch this space ;-) Click the link below for a the section from the Feb/March 2015 Bushcraft Journal (http://www.thebushcraftjournal.com) magazine featuring an article with Daniel where he discusses his upcoming adventure..
the title of Shihan from Aikikai Hombu Dojo!!! 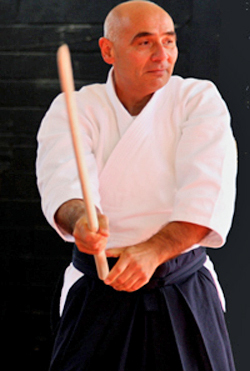 We recently received the fantastic news that Michele Quaranta will officially be awarded the title of Shihan from Aikikai Hombu Dojo, Tokyo. Everyone at Aikikai Ireland would like to wish Michele Quaranta a sincere and hearfelt congratulations on this achievment. 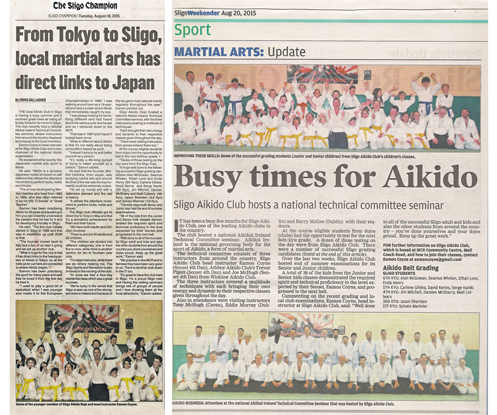 Aikikai Ireland events in Sligo Dojo get great coverage in the Northwests biggest papers!!!! 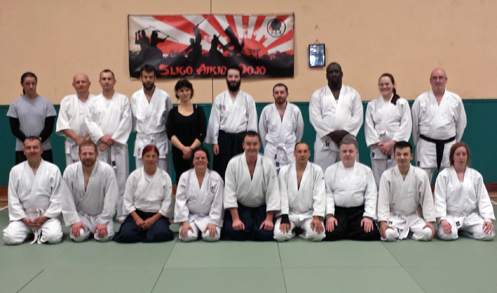 On Saturday the 6th of December the Aikikai Ireland Technical Committee gave a seminar which was hosted by Sligo Aikido Dojo. At the course classes were given by the Tech Commitee instructors Joe McHugh Sensei 4th Dan, Eamon Coyne Sensei 4th Dan and Trevor Pigott Sensei 4th Dan. 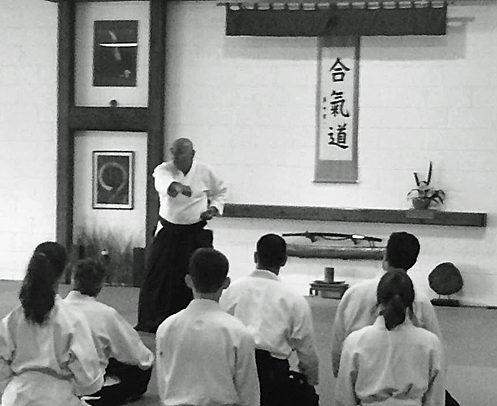 At the course eligible students could grade for the next kyu. The course was a great success. 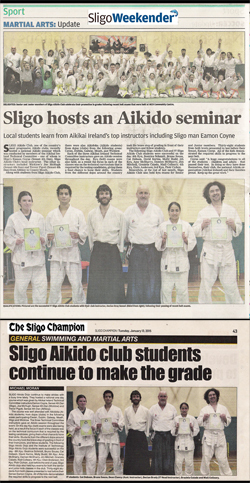 On Thursday the 11th of December also in Sligo Aikido Dojo the Sligo children from both the senior and junior kids classes tested for the next belt with their instructor Eamon Coyne Sensei. 38 kids from the classes presented to test. 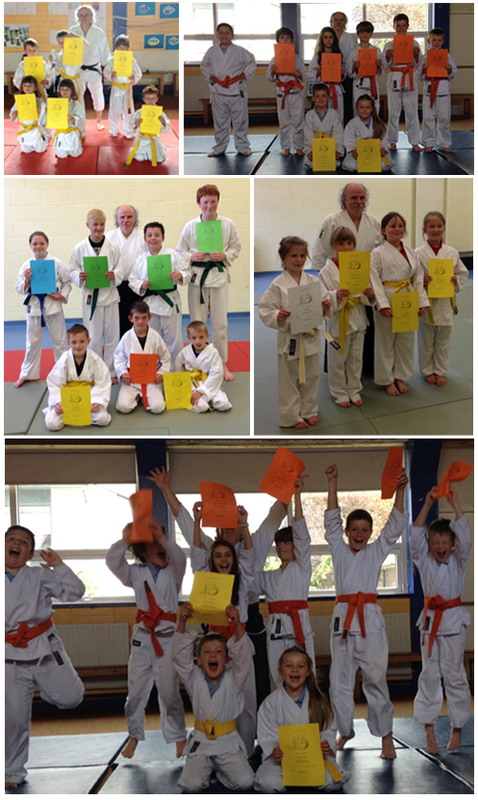 All of the kids done themselves, families, fellow students and dojo proud. Both of these events were given extensive coverage in the local Northwestern media. A huge thanks to both Liam Maloney Sports Editor with the The Sligo Weekender newspaper and also Micheal Moran Sports Editor with the Sligo Champion newspaper.